Something that has been rising in popularity recently is the practice of yoga and meditation. Although having the time to roll out your yoga mat every day might be a little bit unrealistic, taking ten minutes to meditate is something that is much more achievable. I recently downloaded an app called Headspace and although using your phone to meditate might seem a little bit backwards, it’s a great tool to help clear your mind of everything that is buzzing around and just take a few minutes to breath and get more levelled. I try and do it first thing in the morning so I can start the day feeling calm and relaxed. 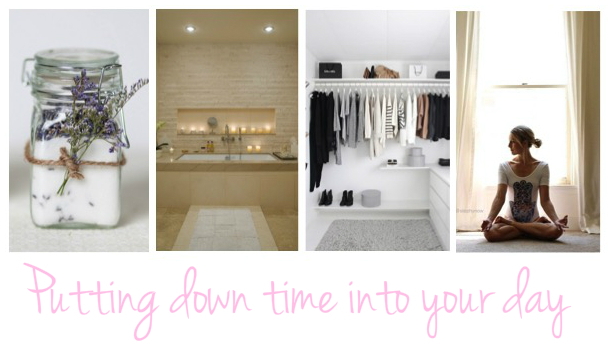 One place you can really enjoy some chill out time is in the bathroom and there are loads of gadgets you can buy to recreate the spa experience at home. Research from UK bathrooms, included in Interior Design Today, showed that items such as whirlpool baths, massaging showers and sensory lights would be in most people’s dream bathrooms. But if those options are a bit too pricey, why not invest in some of these cute little spa lights to pop in your bubble bath. One sure fire way to make your space more relaxing is to clear up all the junk that’s on show. A clean and minimal space will help you feel more chilled and in control. If you aren’t feeling ruthless enough to chuck it all out, Ikea have some great storage solutions so you can cheat and just hide it all away! Another of my favourite ways to relax is by making my room smell beautiful! My favourite scent of the moment is lavender. Often used in herbal sleep remedies, Lavender is believed to have calming influences that can minimise anxiety and sleep disturbance. You can grab a lavender scented candle like this one from This Works or get some fresh lavender and stick it in a vase for a scent that looks great too! This is one that I will hold up my hands and say I find it difficult to follow – but I am trying! They say you should have at least half an hour before you go to sleep away from any sort of technology and that includes phones, ipads, laptops and tvs! The light and interaction that comes from these kind of items make it difficult for your brain to switch off, leading to an overactive mind when you try to sleep. Switch your kindle for an old fashioned book and you will notice the difference in how you feel when your head hits the pillow. What are you top tips for taking time to chill? Have you ever tried any of these tips?